The icebreaker looks like a toy in the cast landscape of Tanquary Fiord, Ellesmere island. 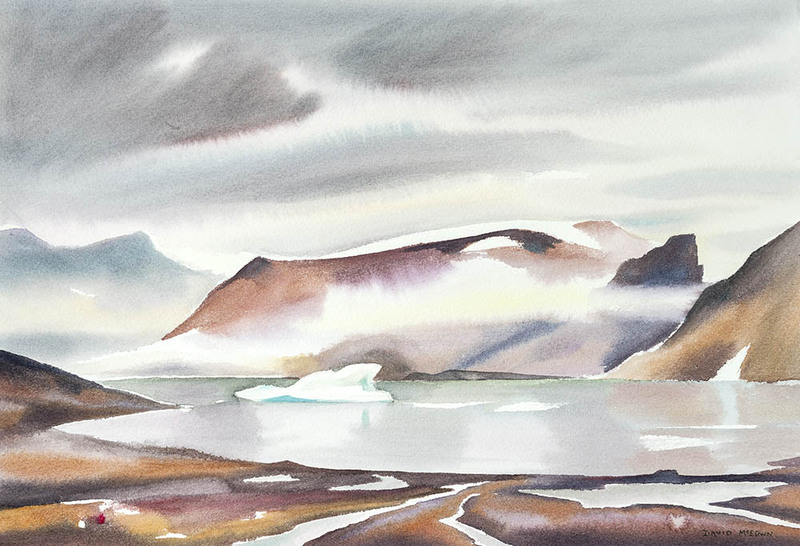 The following watercolours were painted on location during a 7 week arctic odyssey aboard an icebreaker while working as artist in residence for Quark Expeditions. The Kapitan Khlebnikov successfully completed this transit of the Northwest passage, from the Pacific Ocean to the Atlantic Ocean through Fury & Hecla Strait, between 19th July & 9th of August 2006 (including 7 days beset by ice in the Arctic Ocean). We then explored the spectacular coastlines and wonderful artistic communities of Baffin Island. On August 16 from Resolute, our adventure continued north through the remote fiords of Canada's High Arctic to our destination at Ellesmere National Park. We thus returned to Resolute empowered yet humbled by the sublime and stark vastness of this place. More works from these polar trip can be viewed on the Arctic project page.